Changed the name of “Stock Calcium Chloride Solution” to simply “Calcium Chloride Solution” in the materials section. Now references which catalog numbers are applicable for “Sand Equivalent Stock Solution” in the materials section. Tap water is once again allowed to be used in lieu of distilled or deionized water when proven to not affect the test results. In addition, if during testing with tap water, a clearly defined line of demarcation does not form between the sediment and the liquid above it or if the cylinder is still darkly clouded after 20 minutes you will need to retest an untested portion of the same material using distilled or deionized water. Temperature correction factors are no longer allowed. Although the sentence is confusing, it seems that only test results that are achieved when the testing water is at 72˚F±5˚F are valid. Pay factors. In these tough economic times, contractors are bidding with smaller and smaller margins and the pay factor can make or break a job. For materials suppliers one of the most complicated pay factors relies on the asphalt content. Keep a steady, in specification, asphalt content and you're swimming in money but let it jump around and even if you're in spec you could be paying out of your pocket. So what if your plant's asphalt contents are bouncing around: going from high to low from sample to sample? What could be going on? This is a loaded question and one that materials suppliers struggle with constantly. Unless you have unlimited money and time, your plant personnel is probably going to first ask your laboratory if you ran the test correctly. 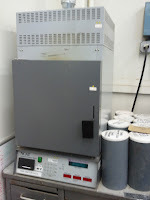 It typically takes less effort and costs less for your technician to rerun the sample than to stop the plant's production to check out what is going on at the plant so usually your first step in a situation where you have varying oil contents is to ensure that there was not an issue with your technique or equipment in the laboratory. For this reason, you should always pull extra hot mix just in case you need to run another test or two. The following suggestions assume that you are using an ignition oven to test asphalt contents. 3. Is the correction factor current? Has the rock source changed in such a way that the correction factor should be adjusted? 4. Is your equipment clean from previous asphalt residue and cleaning solutions? If something like your splitter has asphalt residue on it, you may get a higher oil content on your next sample. On the flip side, if you use certain cleaning products and leave enough of it on the equipment it may eat away at the asphalt in the next sample and give you a lower oil content. 5. Is your ignition oven's exhaust pipe clean? Does it pass a lift test? 6. After a burn, is there still black residue on the sample? If so, your oven is not burning all of the oil off. This could be due to a variety of problems including low air flow, high air flow, the door not sealing, the elements not working correctly, or the scale needing calibration. See your manufacturer's manual for more information. 1. Is there variance in how wet the aggregates are? The plant is probably set for one moisture so with greatly varying moistures (ex: adding washed material instead of dry material) you could see varying asphalt contents as well. One way to check this is testing the feed aggregates for their moistures and comparing the combined moisture content to what is entered in the computer. 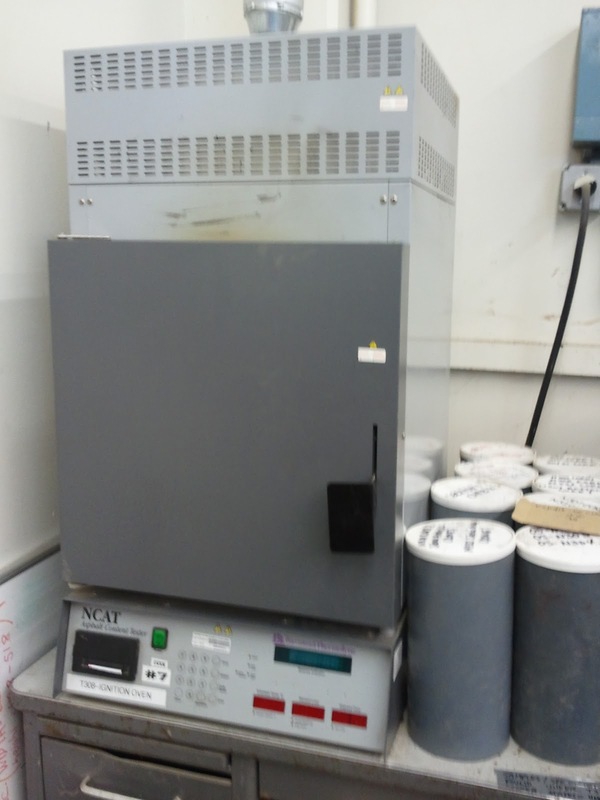 You can also typically mitigate this in the laboratory by running a CT 370 test on every oil content you run. However, I caution you with depending too much on CT 370 when running rubber mixes as CT 370 may not be effective with crumb rubber in the mix. 2. Is the mix gradation cohesive or are some parts fine and some parts rocky? Take a look at a truck of hot mix and be sure that the aggregates and oil are being fully mixed together. If you see an inconsistent mix the plant may need to slow down the plant or, in extreme circumstances, change the flighting in the drum. 3. Another sources of inconsistent coating may be due to the oil injectors not operating properly. There may be an electrical issue or it could even be as simple as a clog. 1. Is your weigh pot emptying completely with each batch? If it is not, you may have some rich batches and some dry batches. You should check your scales to make sure that they are weighing correctly. 2. Is the aggregate fully coated with oil? If not, it may be due to the oil injectors not operating properly. There could be an electrical issue or clog. 3. Is the mix gradation cohesive or are some parts fine and some parts rocky? Take a look at a truck of hot mix and be sure to dig into the bed a little bit. If the pugmill is not mixing fully, the top half of the batch (the part you can see) could still look cohesive even though the bottom half may not look like the top. Improper mixing could be due to missing pugmill tips, poor paddle alignment, or you may just need to increase your mixing time. In addition, I'd like to point out that many of us have upgraded to automation at our hot plants. Along with the upgrade, many of us have learned to trust and rely on the programming blindly. Remember that although most automation is tested at great length, it is still designed by people and has the potential to be wrong sometimes. If you have a software at your hot plant don't be afraid to call them and ask if anyone has seen this problem before. You'd be surprised how quickly they can fix a problem with the software or even give you other ideas on how to investigate your plant. Have more suggestions or questions?